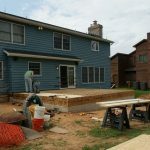 Many homes today are built over a concrete slab, rather than a full basement. While a basement is nice to have, it’s an added expense that many first-time homeowners just can’t afford. But when they want to upgrade their home later on, that concrete slab can be a problem. One way it is a problem is for installing hardwood flooring. 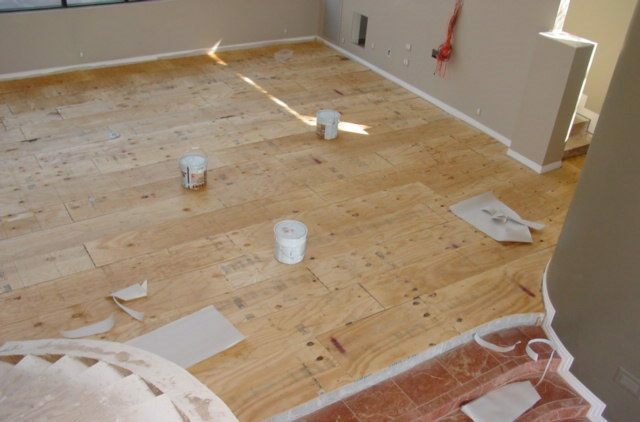 Before hardwood flooring is installed over concrete, a plywood subfloor must be installed. If you’re installing plywood over an existing dry concrete floor, you shouldn’t have any problem. However, a new concrete floor contains a lot of moisture. So, you need to allow it to cure for at least 60 days before even bothering to check the moisture level. The moisture level of the concrete should be down to 5.5% before attaching the plywood subflooring. Floors that are below grade (i.e. basement floors) may never reach this point. If you live in an area which is known for flooding or your particular home has a history of flooding, you may want to reconsider putting in a hardwood floor. Water damages wood and will also damage the finish on the wood floor. A hardwood floor in a basement that floods will not last. Three-quarter inch thick, CDX plywood is normally used for sub-flooring. Some people recommend using pressure-treated plywood, but that is not necessary. Even using pressure treated plywood in a basement that is prone to flooding won’t help, as the hardwood floor installed to it won’t be pressure treated. If the concrete has any areas which are uneven, they need to be corrected before the plywood subfloor is installed. Lumps and bumps of concrete will prevent the plywood from sitting level. Likewise if there is a seam in the concrete, from two separate pours, which is not smooth and even, it will cause the plywood subflooring to sit unevenly, ultimately causing problems with the installation of the hardwood floor. Small gaps, such as joints between separate slabs are inconsequential, as long as they are at an even height. A moisture barrier should be laid down before the plywood. This is usually 6 mil polyethylene film. Asphalt felt, of the type used for roofing, is another alternative that can also be used. The plywood itself should be laid down with the long direction perpendicular to the grain direction of the hardwood floor. This will help prevent cracks forming when the seam in the floor is directly over the seam in the plywood. •	Screws – Concrete screws, such as Tapcons provide for very secure fastening. This requires the use of a hammer drill to create a pilot hole for the Tapcons to go into and an impact driver to seat the screws. When installed, the heads of the screws must be at or below flush, as compared to the surface of the plywood. Screws should be installed every 16 inches. •	Powder Actuated Fasteners – Concrete nails, shot into the floor work well, if you can get them to install with the heads flush or slightly below flush. They cannot be reset or driven deeper once they have been driven in by the powder actuated tool, so run a test before using them. Like the screws, these should be 16″ apart. •	Adhesive Mastic – Newer adhesives are providing an excellent alternative to more traditional methods of installation. When using an adhesive mastic, the vapor barrier is not used, providing some savings. However, these adhesives are expensive, making for a higher overall cost. The mastic itself is troweled in place, providing somewhat of a moisture barrier. Once the plywood subflooring is installed, check the edges for any ridges caused by the sheets of plywood not laying flat or being of different thicknesses. Any ridges found require filling with a flooring grade wood putty and then sanding to provide a smooth, continuous surface for the wood floor to be mounted to.